The in-laws recently returned from the States laden with ‘candy’. I had to resist the urge to cram it all down my throat in one go, and decided to turn some of it into a cheesecake. There was all sorts in there. Pop Tarts (are they still around over here? The most absurd excuse for breakfast ever), Baby Ruths, random chocolates and quirky flavour M&Ms: peanut butter; and pretzel. Both were interesting and the peanut butter ones have that moreish salt/sweet character. I thought I’d whack some of the Cookies ‘n’ Cream Pop Tarts *COUGHoreoCOUGH* in the base and was surprised how well they worked. With the aforementioned peanut butter M&Ms providing a little burst every so often, the peaches were helping offset some of the guilt and help cleanse the mouth. Not an everyday treat, but very enjoyable. Whizz the Pop Tarts and biscuits together to dust and stir in the butter. Pack into an 18cm springform tin and place in the freezer. 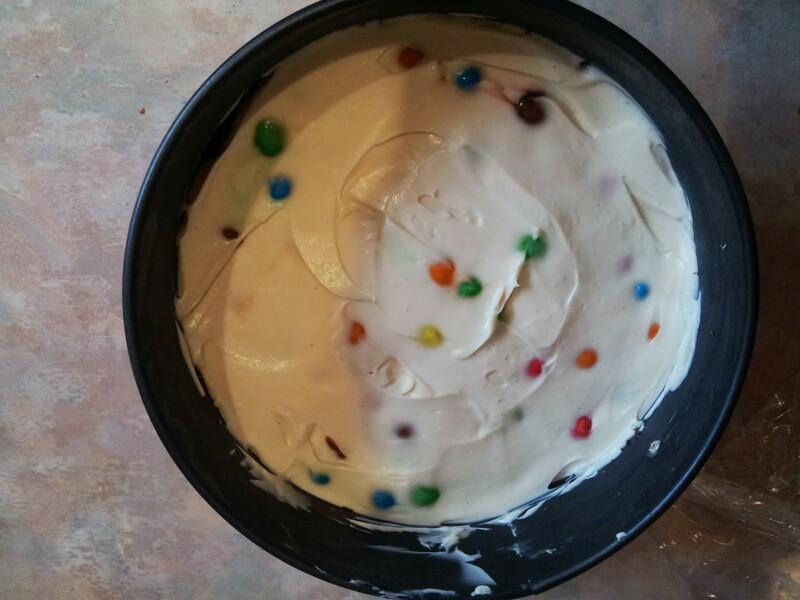 Whisk the cream, cream cheese and sugar together until completely smooth, then stir in the M&M’s. Pour this on top of the biscuit base, cover and leave in the fridge for at least two hours. Before serving, arrange the peaches on top. 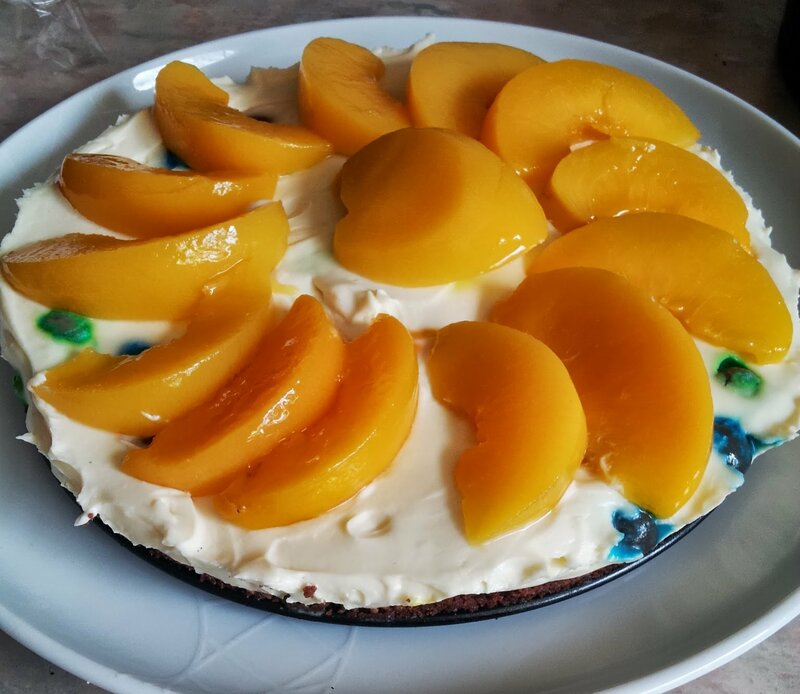 This entry was posted in cake, cheesecake, food, peaches, sweets on August 27, 2013 by Gary. There are few simpler pleasures in life than cooking with your children. Baking cakes with a toddler can be a source of tremendous fun. We knocked these absurd little fairy cakes out one rainy afternoon, and had to make more the next day as they went down so well. 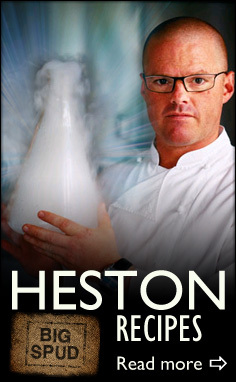 The secret ingredient is Heston’s Chocolate Popping Candy – great fun! Preheat the oven to 180C. Cream the butter and sugar together and beat in an egg one at a time. Fold in the flour, baking powder and popping candy. Divide into 12 paper cases and bake for 10 – 12 mins until golden, risen and cooked through. While the cakes cool, make the sauce. Combine the cocoa and sugar and gradually add water a splash at a time to get an oozy paste. Slice the top off a cake, fill with sauce, replace the lid and drizzle a little more over to serve. This entry was posted in cake, chocolate, food on May 30, 2013 by Gary. I hate slugs. Not for slimy, yukky reasons, but because they wreak havoc on my nascent courgettes. I accepted all kinds of advice, one of which was scattering broken egg shells around the plants. So this cake was a good excuse to break some eggs. This is from The Yeo Valley Great British Farmhouse Cookbook . It’s a new book from the yoghurty people. 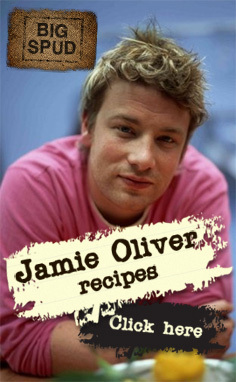 It’s full of recipes like slow-roasted pork and apples, smoky bacon meatballs, and chocolate chip cookies. All of them are well-explained homely fare. And that it’s downside really. It’s all good honest food but all predictable stuff. Nothing here is going to change the way you cook, nor probably anything that will linger long in the memory. It’s a collection of safe, comfortable recipes that you probably already have a method for. Much more interesting is the collection of DIY dairy tips – how to make your own creme fraiche, that sort of thing. I would’ve preferred a book that leaned heavier on their dairy specialism to give it a unique character. This cake was taken from theirs; substituting their raspberries for chocolate. The eggshells didn’t deter the slugs though. I had to repot them to high shelves. Preheat the oven to 180°C. Sift together the flour, butter and salt. Cream the butter and sugar together until fluffy then beat in the eggs one at a time. Alternately fold in the flour and yoghurt, followed by the almonds, then stir through the chocolate. Spoon the batter into a greased or silicone loaf tin and bake for 45 minutes. Cover with foil and bake with another 25 minutes until a skewer comes out clean. When cooked scatter some sugar over the top. After 5 minutes resting remove from the tin to cool. Serve in thick slices. 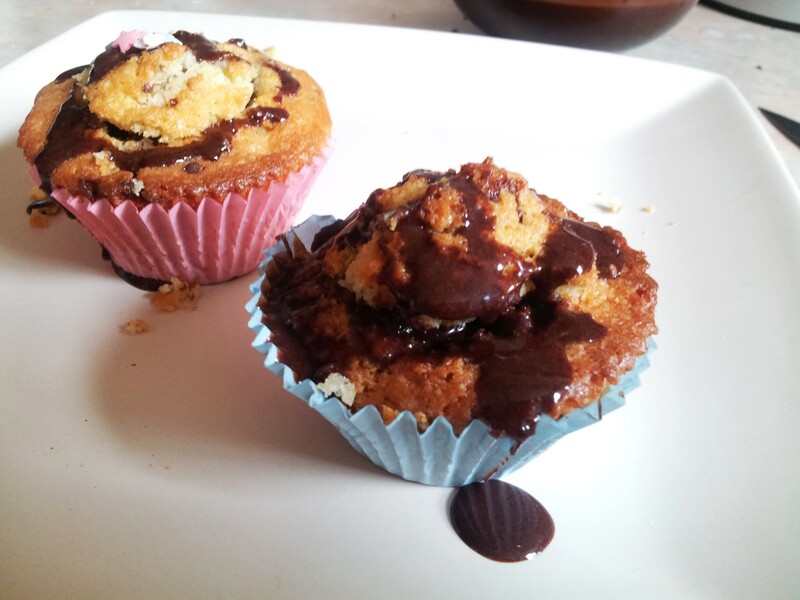 This entry was posted in cake, chocolate, food and tagged sarah mayor on May 27, 2013 by Gary. What a show-stopper this recipe is. How I came to get the recipe is still utterly bewildering to me. 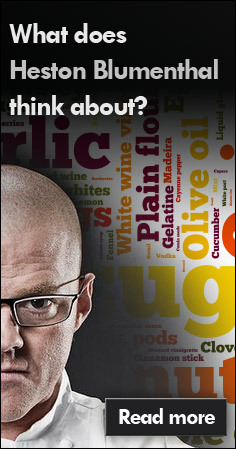 Would you like to go to the Waitrose Cookery School and have Heston Blumenthal cook for you? Um, let me think about that fo- yes please. So I rock up, where they are filming an Easter show for Waitrose TV. I’ve been to the Cookery School a couple of times before, but not in these circumstances. The whole thing is hosted by Sue Perkins, who I’ve always wanted to best friends with. It has the recipe to be a completely amazing afternoon. It begins very strangely. I pretty much walk in off the street and take a quick visit to the gents (I promise, not too much detail here but the context is important). I’m there not a minute, doing my thing, when someone takes up the urinal next to me. I’m not sure if you know the rules of public toilets but you don’t budge your neck an inch. But I do. And I can’t help but notice relieving himself next to me is Brian Turner. What do you do in that situation? I’ve admired Brian Turner for years, for me he reaches back to Ready Steady Cook days and he’s never really gone away. Whenever he’s on TV I know whatever he makes is going to be brill. But do I say hi mid-flow? I elect not to, hoping to get a chance to introduce myself in a more normal surroundings. Making my way back into the school itself a Waitrose rep introduces herself and says I’m going to be on the top table with all the chefs. Urp. So the scene is set: Heston Blumenthal, Brian Turner, Dhruv Baker are cooking the food alongside Cookery School stalwarts Gordon and Eleni, while Sue Perkins presents. At one point during the afternoon, Sue Perkins is sat next to me, shovelling lamb on to my plate that has been roasted by Heston Blumenthal who is opposite explaining his mustard gravy, with Brian Turner sat on the table positively barking that we Brits must return to our roasting greatness. As I sat there with a glass of ridiculously good Lebanese red wine, I was momentarily lost in a moment of surreal stupor: how the hell did I get here, eating this, with these people? I felt stupendously unworthy. My left ear’s moment of glory as noted vegetarian Sue Perkins shovels lamb on to my plate. Needless to say, the afternoon was complete magic. Sue cemented herself as the witty professional, Brian was exactly the person he is on TV, and Heston cooked lamb for me. The whole video featuring Heston’s roast lamb, Dhruv’s accompaniments and this recipe, plus more besides, can be seen on the Waitrose TV website. However in tribute to that afternoon I cooked the dessert served up by Eleni: a stunning baked alaska that looks like far more effort than you actually put in. With a few choice ready-made ingredients propping it up it’s a great one for a dinner party. Using an ice cream scoop, form 8 large balls of the ice cream. Place on a plate or tray and return to the freezer, so that they are as frozen as possible. Meanwhile, take the slices of madeira cake and using a 6cm round pastry cutter, cut into 8 discs, and set aside. Make the passion fruit coulis, place all the ingredients with 4 tbsp water in a small pan and bring to the boil. Continue to boil for about 4-5 minutes until the mixture has reduced to a nice thick, syrupy consistency. Allow to cool then refrigerate until needed. To make the Italian meringue, place the caster sugar in a saucepan and add a little water until a wet sand texture is achieved. Then heat the mixture and bring to the boil and continue to heat until the temperature reaches 118°C. Using a an electric mixer start to whisk your egg whites on a medium speed. Once the sugar reaches 121°C, remove from the heat and gradually add the syrup to your whisking egg whites and increase to maximum speed. This will take approximately 5 minutes to whip up into a smooth, glossy meringue. Place this mixture into a piping bag with a star shaped nozzle, about 6mm or simply cut the piping bag at an angle and set aside. To assemble, place the ice cream balls onto the sponge discs and pipe around the Italian meringue and smooth over with a palette knife so that none of the ice cream is exposed. Take the piping bag and pipe peaks around the Alaska starting from the bottom and working your way up to the top. Once all the surface space has been covered return to the freezer and leave there until ready to serve. When you are ready to serve, preheat the oven to 220°C, gas mark 7. Then place the Alaskas in the oven for about 5-7 minutes or until the meringue turns a nice golden colour. 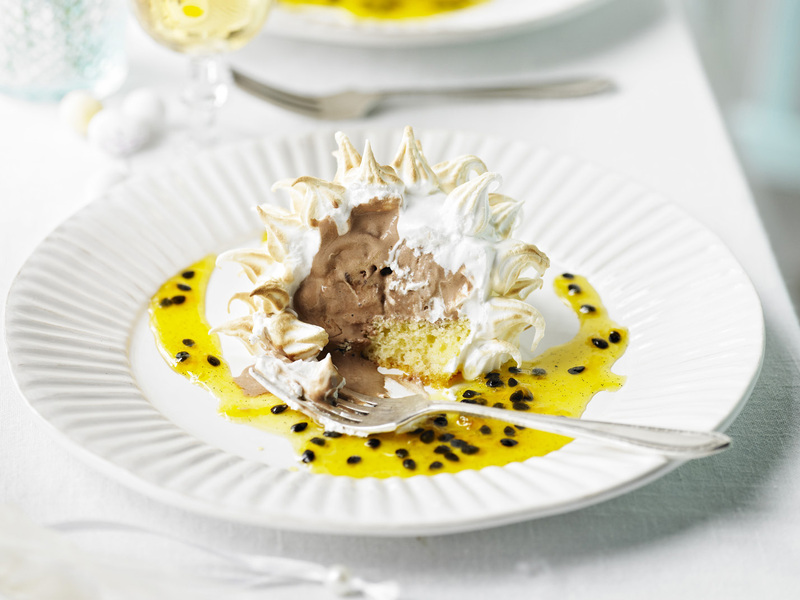 Spoon the passionfruit coulis onto the plate and place the baked Alaska on top. Serve immediately. This entry was posted in cake, egg, food, ice cream and tagged eleni tzirki on March 20, 2013 by Gary. If there’s a dessert I’m guaranteed to go giddy for, it’s Black Forest Gateau. The combination of cherry, chocolate and cream is just perfect. And so if I see an opportunity to reinvent it, I’m there. 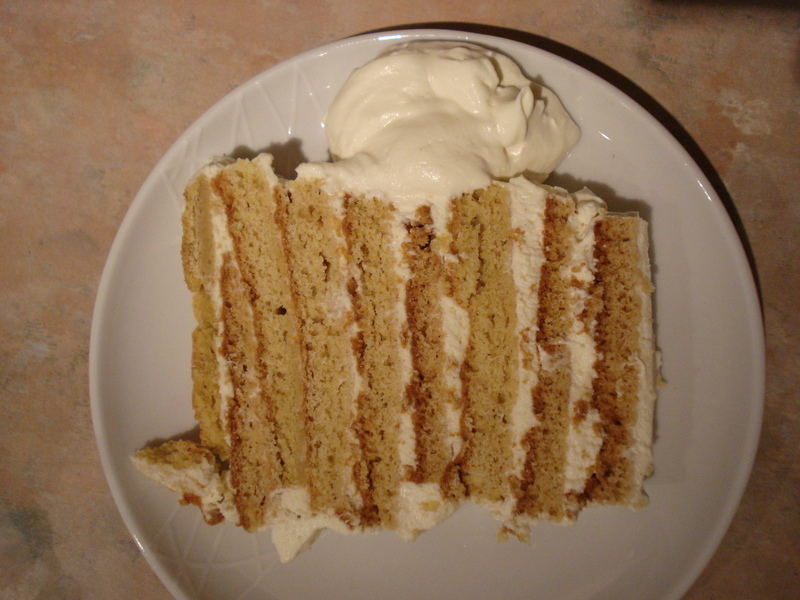 I wanted to reuse one of my favourite recipes of this year was Russian honey cake. It’s such an enjoyable technique I knew it had legs. And this black forest version proves it: the ‘cake’ is quite biscuity, but if you can stand to leave it in the fridge for a couple of nights, you will have a dense, squidgy and super moreish cake. So good. Preheat the oven to 170°C. Line a large baking tray with greaseproof paper, then give that a little extra grease. Melt together the butter and jam until fluid and then turn off the heat. Whisk together the eggs, salt and sugar until pale and fluffy. Gradually whisk in the cherry jam butter a trickle at a time, and then sift in the bicarb, cocoa and flour. Stir until combined to a dough – this will be quite firm, more like a biscuit dough than a cake batter. Using wet hands press this mixture in to your baking tray, as thin as you can. Bake for around 8 – 10 mins, until the it is golden on top and a skewer inserted comes out clean. Peel off the paper and leave to cool. While it cools make the cream. Whip the cream and sugar until soft but still a touch runny, then incorporate the mascarpone and keep beating until it just holds its shape. When cool, slice the cake into long thirds. Then proceed to cut in half horizontally, by placing your hand on top and slicing across with your sharpest bread knife. You want a thickness of about 5mm. Slather one side of the cake slices with jam, and the other with cream. Sandwich together to make a giddy tower. Be generous with the cream as it is going to get absorbed by the sponge. Smooth some more cream over the top and sides of the cake and leave to set in the fridge for about 12 hours. Before serving grate over some dark chocolate. 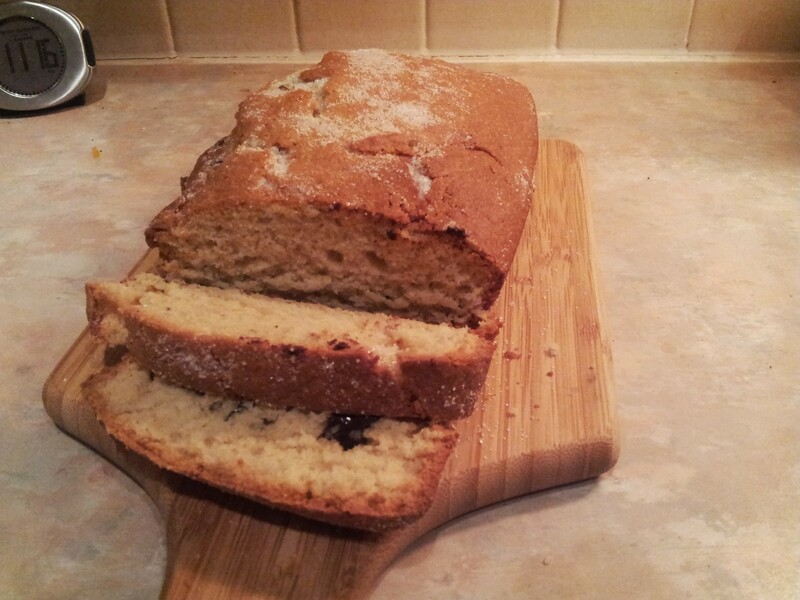 This entry was posted in cake, cherries, chocolate, food on December 12, 2012 by Gary. “Russian tea room”. I’m not sure about you but that phrase conjures no images whatsoever in my mind. When Helen mentioned that she’d scored us a table at Knightsbridge’s Mari Vanna, I had no idea what to expect. Skirting around Hyde Park I missed it a couple of times. The decor confused me: from the outside I thought it was a florist, and on the inside your Nan’s house. There is a frightening amount of knick-knacks, gewgaws and tat littering every surface. Photos adorn the walls (which we were informed are all staff member family snaps), preserves are rammed into a cupboard, the day’s pastries line the counters. 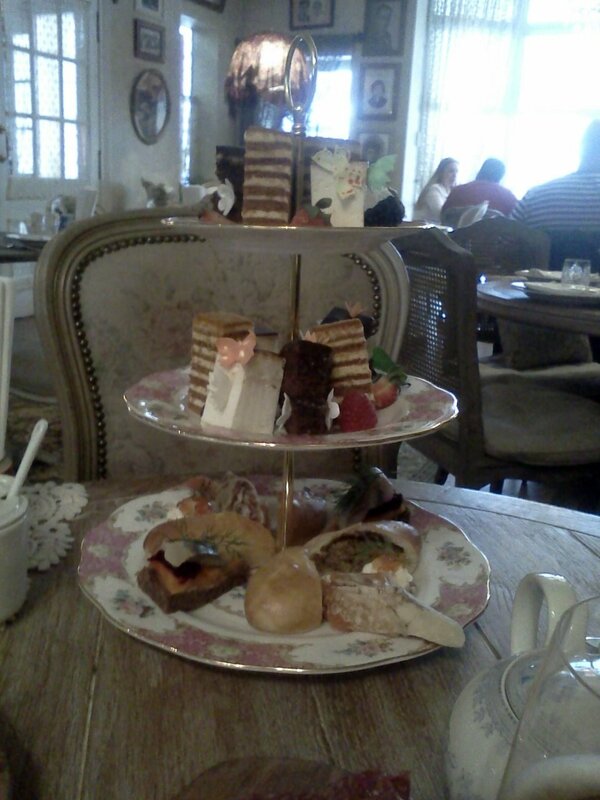 Bamboozled by choice, we kinda throw a dart into the menu and went for a couple of random platters: the “men’s tea”; and the more classic Russian high tea, whatever that might be. It was a great time to be in there: packed with Olympic tourists, the variety of dialects buzzing back and forth afforded us a great deal of people-watching. After spending a few minutes supping beer and Georgian tea, chatting about the fictional “Mari Vanna” with our host, and admiring the dozen or so doorbells out front, our food arrives. 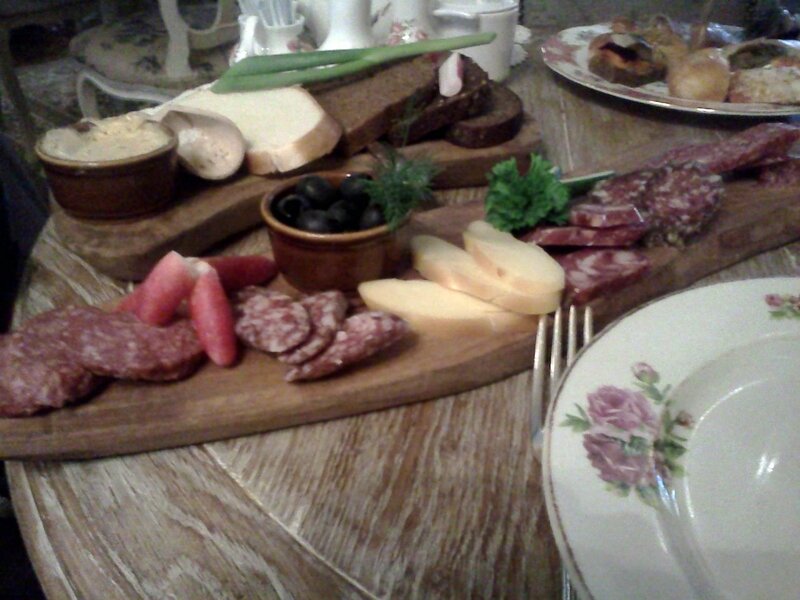 The platter in front of me is various kinds of salamis, smoked cheese and black olives. The salamis were perfectly pleasant but nothing surprising, Helen found them too strong. The smoked cheese again was perfectly good but nothing to set the pulse racing. That said, I am sucker for almost anything served on a wooden board. The tuft of dill was welcome, and the fragrance was obvious in much of the food that came past our table. But the desserts are where it was at: the set milk pudding had Helen and I debating for quite a while how the texture was achieved (whipped egg white folded through milk and set in a bain marie, we guesstimated), although a rather average chocolate cake was ignored. However by a million miles the star of the show was a sweet and caramel-laced honey cake. Goodness how we cooed and ooed and aahed over it’s dozen layers of squidgy sponge and whisper-light cream. It is a staple of Russian houses come Christmas time, and it’s not hard to see why. It was nothing short of brilliant, and I resolved to have at it myself. I managed to find a decent sounding recipe here, which I’ve bashed about a bit for my own purposes. And the resultant cake, while not the gossamer-fine thing of beauty from Mari Vanna, was still a homely and squidgy teatime treat. I’d aim to get that dough baked thinner next time, and try to really slice it as thin as I can for maximum moistness. I had a really pleasant time at Mari Vanna – particularly this cake – but watch those prices, as Jay Rayner observed. Thanks to Helen for the invitation. Preheat the oven to 170°C. Line a large baking tray with greaseproof paper, then give that a little extra grease. Melt together the butter and honey until fluid and then turn off the heat. Whisk together the eggs, salt and sugar until pale and fluffy. Gradually whisk in the honey butter a trickle at a time, and then sift in the bicarb and flour. Stir until combined to a dough – this will be quite firm, more like a biscuit dough than a cake batter. Using wet hands press this mixture in to your baking tray, as thin as you can. Bake for around 8 – 10 mins, until the it is golden on top and a skewer inserted comes out clean. Peel off the paper and leave to cool. While it cools make the cream. Whip the cream and sugar until soft but still a touch runny, then incorporate the creme fraiche and keep beating until it just holds its shape. When it’s ready loosely ripple through the honey. When cool, slice the cake into long thirds. Then proceed to cut in half horizontally, by placing your hand on top and slicing across with your sharpest bread knife. You want a thickness of about 5mm. Save the offcuts for later. Alternately sandwich cake and cream to make a giddy tower. Be generous with the cream as it is going to get absorbed by the sponge. Smooth some more cream over the top and sides of the cake and leave to set in the fridge for about 12 hours. Before serving, whizz up the cake offcuts with a Crunchie bar in a food processor and sprinkle over the top. If you have some spare cream, serving that on the side wouldn’t go amiss :-). This entry was posted in cake, cream, eating out, food, honey on August 14, 2012 by Gary. I spotted this little gem on the pages of an Ottolenghi article in Waitrose magazine and made it immediately: it’s a squidgy and sweet Turkish cake. Surfing around it seems to be a very popular and traditional dish and when you taste it it’s not hard to see why. 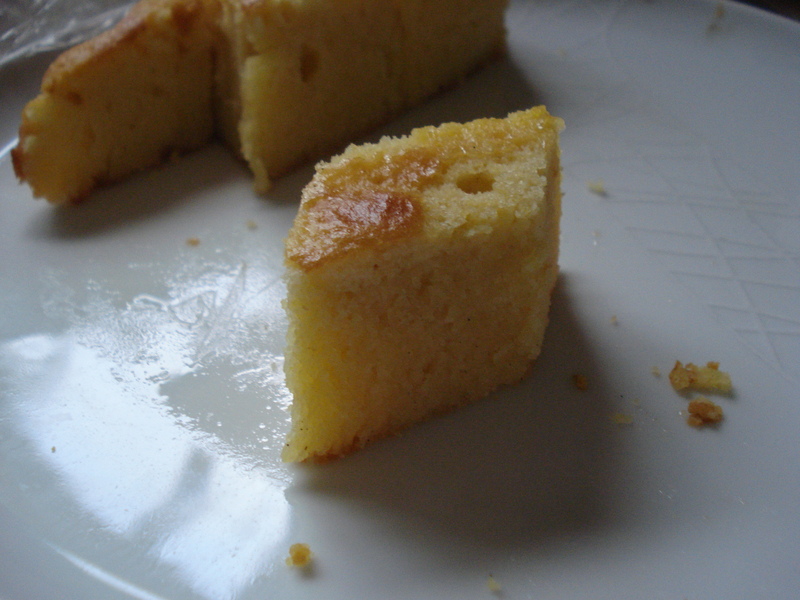 It’s kind of like a drizzle cake in that you bake a sponge, then slice it up and pour over a syrup while it cools. And definitely follow Yotam’s advice: it improves immeasurably overnight as the cake soaks up more and more of the lush, sweet juice. Perfect with a cup of tea. You are supposed to use marmalade in the batter but I used some leftover orange jelly. You know the other clever bit? Cutting the cake into diamonds. No messing about with even slices, just merry little diamonds which are easy to eat and cute for the virtue of being different. Preheat the oven to 180°C. Grease a 21cm springform tin and line with greaseproof paper. Beat the egg yolks and sugar together until pale and then incorporate the flour, semolina, pinch of salt, zest, butter and marmalade. Continue beating until smooth. In a separate bowl whisk the egg whites to soft peaks and then gradually fold into the batter. Pour the batter into the tin and bake for 20 minutes or until a skewer comes out clean. While the cake is in the oven make the syrup. Put all the ingredients in a saucepan with 300ml water and bring to the boil. Simmer for 10 minutes. While the cake is still warm and in the tin, slice it into diamond shapes about 3cm wide. Pour the syrup over the cake – it will look like too much but it will take it all! – and leave to cool and let the cake soak up the juice. You can eat it straight away but it’s so much better if left overnight. This entry was posted in cake, food, lemon, orange, polenta and tagged yotam ottolenghi on June 15, 2012 by Gary.